Across Lower Arrow Lake, about 59 km south of Nakusp on Highway 6 between Fauquier and Needles and provides year-round ferry service, 24 hours a day, every day. Every 30 minutes on the hour and half hour from Fauquier 5:00 a.m. – 10:00 p.m.
Every 30 minutes at 15 and 45 minutes past the hour from Needles 5:15 am – 9:45pm. 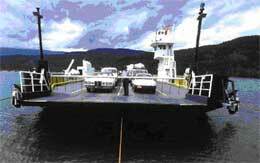 On-demand service 10:00 p.m. - 5:00 a.m.
For more information, please contact the WaterBridge Ferries office.